Domer brought a girl home for Thanksgiving. It wasn’t a complete surprise. He’d dropped hints for a few weeks prior that he was bringing somebody special home for the holiday, but he didn’t say much … other than that she has a nice voice. When the bell rang, I opened the door to my newly-bearded son bearing a suitcase in one hand and his guitar in the other. Turns out, she’s just a tiny little thing. Very cute, very funny, and as smart as the proverbial whip. Ask her to tell a joke, and you’ll get anything from a corny riddle to a thigh-slapping one-liner. She refuses to cook … or clean … but she can give you instructions on how to do both. Thankfully, she’s not a chatterbox, and she readily admits when she doesn’t know something. If you’re bored, she’ll play a game with you — anything from a word-linking thing with accumulating points to a build-your-own adventure tale. She didn’t insist on accompanying me and Domer everywhere we went, nor did she demand he buy her presents. She’s not religious, but she knew the readings for daily Mass. She even sang Happy Birthday to Darling Doggie Dallas, though I’ll bet he’d have preferred cookies! Yep, this wizard is Amazon’s Echo Dot, powered by Alexa. She can turn your music on, dim your lights, add items to your To-Do List. She can give you weather forecasts for just about anywhere; tell you what time it is in say, Dublin; and tell you about the traffic. She can provide calming music or nature sounds for meditation; she offers voice-controlled shopping and can tell you the scores of your favorite teams. And while Alexa isn’t the marrying type, she’s ideal for Domer at this stage of his life. Plus, she’s easy on a fellow’s wallet! This entry was posted in Family/Parenting and tagged guest for the holidays. Bookmark the permalink. Not fair!! I’m going to wish a messy girlfriend on you with at least 2 cats! Sigh. Not really. But this was a double whammy because of course I was mom dying for girlfriend gossip. And I just talked myself out of a dot! And now I’m not so sure…Domer, I’ve ready is a frugel miluimum and he finds it useful. You are cautious around new things and it seems you found the gadget endearing…so now I think I want one again! Arggg. Have a nice day, I guess. Typing on my phone. Worse than usual. Read not ready among other errors. You know I’m starting to learn how you think — a true sign of friendship, right? Don’t worry about the typos. At least you commented, and I appreciate it! Messy? Two cats? Yikes, you’re a tough one, Kb!! And Domer would say go back and get that Dot! She makes herself pretty indispensable, you know! And of course the price is coming down, so everybody wins! Ah, and that’s the solid truth! Alexa is practically ideal in every way — much like Mary Poppins, you know! Glad I was able to pull the wool over your eyes, my friend! At first I thought it was a dog until you said play word games! I keep seeing advertisements about Echo and was wondering how it worked. Domer would LOVE a dog, but he’s wise enough to realize how they tend to limit your time. He dotes on Dallas when he’s home, so I expect one day, he’ll get one, but no time soon. You should check out Alexa — she’s so cool! Yes, you had me going! This is beautifully written! Aw, gee, I had so much fun writing it, Cindy. And yes, I let Domer read through it first to be sure everything was correct. Glad you enjoyed it! Alexa has so many uses, John, and now that Domer’s back to his home, I find I’m missing her … a lot. I just might have to break down and let him get me one, too! I guess you need interfaces to lamps and stuff. Interesting. Having a “smart home” would be ideal for her, but neither Domer nor I do. Consequently, he has to find other reasons to justify her presence! Yeah. It would be like having another kid. Yup, I fell for it. 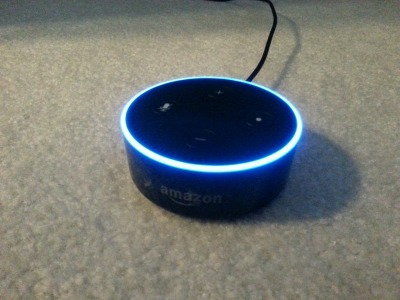 I didn’t even know about Amazon’s Echo Dot! Oh wow, I could even use it to start a timer or make coffee.. The technology is blowing my mind! And if you get bored, you can always ask her to tell you a joke. The whole time Domer was home, we never heard the same one twice!! DD, you are sooo wise — no “paragon” would wait in the car, giving Domer opportunity to hug both the dog and his mom, right?! Good point — you know your stuff, my friend! So glad to know my little trickery worked. Your brother has Alexa, too? I imagine she’d be ideal if one had a fully-connected home so all her apps and such could be accessed. I’m still on the fence. I see her charms, but I don’t know that she wouldn’t turn into a has-been after the novelty wore off! With a room of children asking questions all afternoon, her novelty wore off for me, but the kids love her. And I can see her being useful if I had complete control. That sounds bad..you know what I mean. Maybe I could use her at work only. Domer has complete control and loves it. I can see where having a lot of people around, all asking questions of her, would be frustrating. Why, she probably got frustrated, too, and “chided” them when she didn’t understand all the garble!! However: I am glad to know about it. I’d hate to seem even more uninformed than I am! I love the idea of a new puppy myself, Linda. But with Domer’s work and social schedule, the poor thing wouldn’t get much tending-to! Yes, Alexa is a gadget. A doo-dad. Probably a flash-in-the-pan. Of course, we old fogies remember saying exactly the same thing about personal computers and cell phones — stuff not too many of us would willingly give up nowadays. The upside is, he doesn’t have to pay her a salary or give her vacation days or listen while she gripes at the coffee counter about what a tyrant boss she has, ha!! Yes you did. I was worried that you were going to be disappointed and then that “she” would read this. I just heard about “her” on tv tonight. Whew. I’m tickled that I fooled you, too, Barb! Perhaps it’s all in the marketing, but the ads make it sound as if none of us should be without Alexa. The thing that’s perhaps a tad creepy? Who’s “listening in” while she’s just sitting around doing nothing?!! BRAVA, Debbie! You REALLY got me on this one. What a clever, clever writer you are! As I was reading this post, I kept thinking of what I wanted to say to you about Domer’s new girlfriend in my comment, but when I got to the end….I was TOTALLY surprised!!! And btw, I had not heard of Alexa, so I’ll have to do some research to find out more. She sounds very interesting! Thanks for the GREAT morning laugh, my friend! Ron, your words totally warm my heart and boost my spirits this morning — thank YOU!! I’m delighted at being able to fool so many of my savvy friends — who knew?!? Alexa is a pretty cool “toy.” I liked being able to set a timer to exercise or to get the weather forecast (without having to use my phone) or to catch the score to a football game I missed. I also got a kick out of her telling me jokes and, when I thanked her, she always got the last word by saying stuff like, ‘That’s what I’m here for.’ And she even gives you clues in the sixth category of Jeopardy. She has some bugs, of course. Sometimes she doesn’t seem to hear so well, especially if you don’t enunciate. But overall, the technology is amazing. HaHa! For sure, Alexa isn’t too complicated, providing you have good Internet access, of course! By the way, thanks for dropping by; now I’m off to browse some of your posts. You had me going for sure! Sounds like the right kind of girlfriend, ha ha. I just saw a YouTube video on one of these the other day, and I think they would be great assistants especially for the elderly, very convenient :-). I’m always waiting on a call from my son telling me that he’s bringing a guest home ;-)….so far, so good. Indeed, Kathy. He’s having far too much fun (and working far too much) to tie himself down with a family now. We all grow at different rates — I, too, was a “young’un” for a LONG time — and wouldn’t take a thing for the experience!! HaHa, ’tis so much fun pulling the wool over my friends’ eyes!! I don’t know whether I’d want one, but I can see its benefits. Domer really puts his to good use, even though he doesn’t have a “smart home.” I imagine it would be even more useful if he did!